Schluter’s KERDI Shower Kit is one of the best options for shower remodels. But every shower project has challenges. And it’s super easy to make bad mistakes, even with the KERDI shower kit. So we made three step-by-step videos showing all the details for this installation. Video 1 shows what’s in the kit, how to install the niche, and prep the pan/curb. 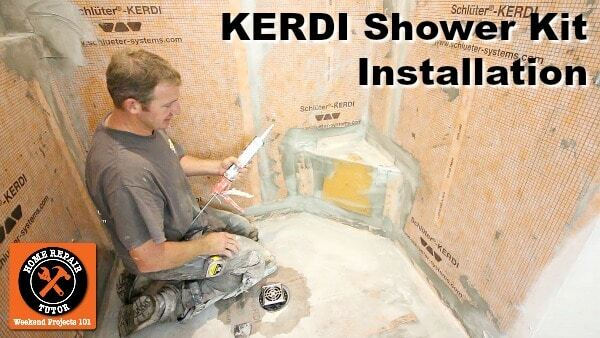 Video 2 shares how to waterproof the walls using KERDI membrane. Finally, Video 3 explains how to waterproof the shower pan & curb and install the drain. If you’re a complete newbie we promise you’ll be able to install the KERDI shower kit after today! In this bathroom we installed a 4′ x 5′ shower and used the KERDI shower kit; it included a 48″ x 72″ shower pan, which we cut to size. Our wall substrate was drywall and that will be waterproofed using Schluter’s KERDI membrane. Btw, Schluter recommends drywall for this type of installation, but you could skip this step and use KERDI-BOARD. Also, an 8 foot curb comes with the kit, and we’ll show how to cut it down to 5 feet. Schluter shower systems require a solid subfloor and in this example we had a 3/4″ plywood subfloor. Check the floor is level by using a 4 foot level. In this shower we installed a 12×28 inch shower niche in the corner of the shower plumbing wall, which was the only interior wall. It’s important to only install shower niches inside interior walls. We had to cut the edge of the niche and customize it for this installation because our tile will run into it from the main wall. Niches are installed using Schluter screws and washers. Cut and fit drywall around the niche and the rest of the walls in the shower. It’s imperative the shower stud walls be plumb and even with each other. Screw drywall to the studs using acceptable building code screw spacing and screw length, we used 1-5/8″ coarse threaded screws. For this project we used Schluter’s ALL-SET, which is a great thin-set mortar for their showers. Mix ALL-SET per the directions; this is SUPER important to get the right consistency and pot life for the mortar. We used 6-1/2 quarts of water for one bag of mortar. And mixed the mortar for 5 minutes, allowed it to slake for 10 minutes, and mixed it for another 3 minutes after slaking. Yes, we totally get that this is very specific but all new mortars require the directions to be followed to a ‘T’!! It helps to place a plumb line on the drywall to indicate where the KERDI membrane should stop. After this is done, take a damp sponge and wipe down the drywall to remove any dust and to prevent the thin-set mortar from setting up too quickly. Then use a KERDI trowel to work the mortar into the drywall surface. Directionally trowel ALL-SET on the wall to help remove air gaps and collapse all the ridges in the mortar. Compress KERDI membrane into the walls, going from the ceiling to the floor. Remove air gaps and flatten KERDI using either a KERDI trowel or 6 inch drywall knife. Overlap all KERDI membrane by 2 inches. We also used Schluter’s ALL-SET to adhere the pan to the 3/4″ plywood using a 1/4″ x 3/8″ square notch trowel. All mortar ridges should face the same direction. Set the pan in the mortar, walk on it to compress the mortar, and check the coverage by lifting it up. Apply mortar to the edge of the pan and the first 6 inches beyond the pan where the curb will rest. Set the curb in the mortar and check that it’s level, especially if using glass shower doors or glass panels which need the curb level. We actually forgot to install our corner bench and had to do that after setting the pan. Not a big deal, but the bottom of the bench has to rest on the plywood. Waterproof the bench using two outside corners and one inside corner, then overlap these with Kerdi-Band. Apply ALL-SET around the shower drain and glue it to the P-Trap below the shower pan. In our prior video we discussed how to dry fit the drain pipe and cut the ABS to size. Cut Kerdi membrane to the size of the pan and apply mortar to the top of the Schluter shower pan, fill in all the waffles with the flat side of the trowel. Then embed the Kerdi membrane to the top of the pan, and scribe cut it against the bench. Get Kerdi as tight as possible to the wall but don’t stress over it being exact. This intersection will be waterproofed using Kerdi-Band, which will overlap the wall and shower pan. KERDI shower kits are available at Home Depot or Amazon. Our next videos will share tiling tips for the shower pan and walls. We used pebble stones for the shower pan and that made the shower look awesome. So keep your eyes peeled for those videos. Gold members get Lifetime access to the Video Library and Platinum members get Lifetime access to our Video Library, Courses, and Support (via email or Facebook). Bathroom Repair Tutor is fantastic if you want step-by-step instructions and guidance from professionals. CAN THE 12 X 24 TILE BE INSTALLED HORIZONTALLY? Yes, great question. Tiles can be set in any orientation over these walls.